This was actually a pretty good shoot the chute. The tunnel was a nice touch and I really liked the double drop, as it was bigger than most shoot the chutes and it was very fast. I got pretty wet, but not soaked, which was good because its indoors. Finally, the ride interacted very well with the canyon theming. I liked this ride. 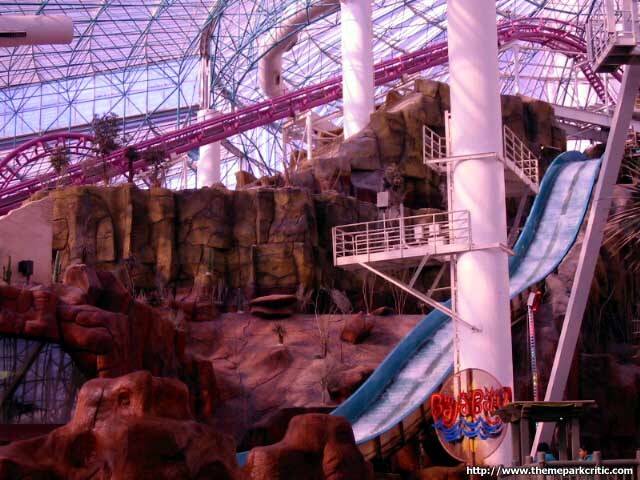 The drop is fun, but if you get wet, its horrible because your indoors and its cold! A nice boat ride. While cruising through the first tunnel, I reached up and touched the ceiling. Cruising some 6 stories up, a Canyon Blaster train went by and plummeted. The drop was cool, because it contains a great dip. We all got wet. The boat went through the after-drop turn quickly. Unfortunately, I rode CB next, and I got the seat wet. Ride this in the dome with short lines. 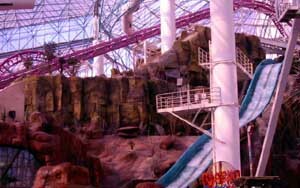 The Rim Runner is nicely themed with nice scenery.It is a log flume ride. It was a fun ride. It is rerideable. The duration is long. The capacity is large. I thought it was great how they put this thing in there in the "canyon". Its great to see Canyon Blast like you do on the way up, and the drop on the way down was great, altough it doesnt get you wet...which is good since most of the time it is cold in there. Average shoot-ride. 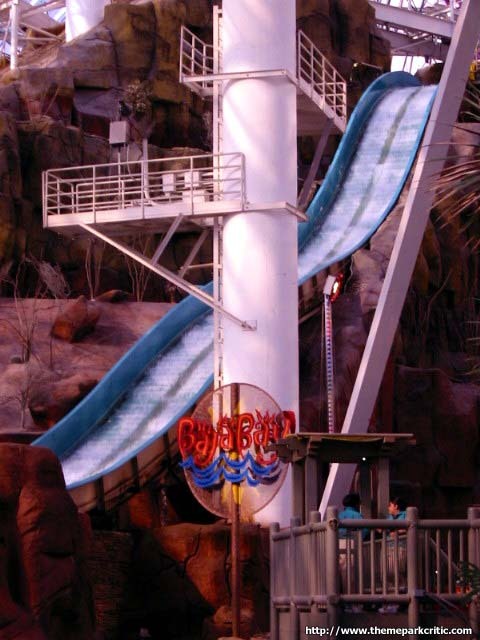 The splashdown doesnt leave you wet (which I can take or leave, especially since this is indoors), and the drop isnt very terrifying or intimidating. The indoor scenery kind of helps this ride, but not enough to merit a 2nd ride or an all day pass. A decent log flume ride with a pretty good drop in it. However, a bit shorter than most log flumes. And, oddly, you dont seem to get very wet at all..
Not the best boat ride, but it was still pretty fun. The drop was nice. The thing is that despite the big splash, you dont seem to get that wet. That takes away a few points. Considering its indoors, its not that bad. The drop isnt that fun though, I think just making it one big drop instead of 2 little ones would make it a little more intense and exciting. I got pretty wet though, which is both good and bad. With the air conditioning I was cold, but thats ok, if I didnt want to get wet I shouldnt have ride.